See the original of this article on the Earth Island blog. It’s a fair question. And it’s critical to realize that the answer does not turn around the dangers of a pipeline spill, though these are real, but on the climate implications of tar-sands development. Right now, as it becomes obvious that the supply of conventional oil is not infinite (see, for example, here, and here), the future of energy is coming into play in a new way. And so it’s absolutely imperative to prevent the better possibilities from being closed down by a junkie energy policy that doubles down on fossils by targeting high-carbon, “unconventional” dregs like Canadian bitumen. In fact, allowing major investments in fossil-dregs infrastructure would be catastrophic, even in this a world of catastrophes. Others have done rollups of the arguments against XL. See, for example, this quick briefing. But I’m going to skip right over the politics, the economics and all the other local color and head straight for the tar-sands / climate-catastrophe math. 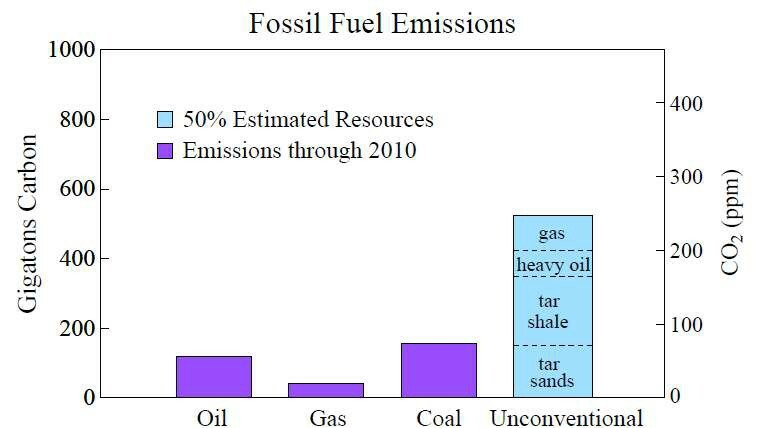 I’ll try to get it clear because, while lots of us have heard that Jim Hansen says it’s “game over” if the carbon in the unconventional Canadian fossil fuels is liberated, few of us know exactly what he means. The key concept here is that of a “carbon budget.” This is the total amount of carbon that can be dumped into the atmosphere if we want to keep total planetary warming within “manageable” limits. Now, obviously, there’s no agreement on how large this budget it, but there doesn’t have to be. Leave aside the deniers and focus on the short term – the 2010 to 2050 period that will lock-in the planet’s future climate – and all the reasonable numbers are extremely small. This is not simple material, but one good way of stating the bottom line is that, if we want halfway decent odds (80%) of not overshooting a global 2°C temperature target, then we should try to hold total global 2000-2050 emissions down to 886 Gigatonnes of carbon dioxide (CO2). If, like many of the Keystone XL protesters, you prefer the stricter goal of atmospheric stabilization at 350 parts per million of C02, your budget would be even smaller, though not by much. The problem is that much of this 886 Gigatonnes budget has already been wasted. As of a few months ago, all the nations of the globe had pumped up the post-2000 global emissions by about 321 Gigatonnes, which left us with a remaining budget of 565 Gigatonnes. At current rates, that is going to vanish into the air long before 2050. Which is why “peak oil” is a bad name for our problem. Because there is no way, in any positive or at least soft-landing storyline, that we’re going to be able to burn the bulk of even the already proven conventional fossil fuels, let alone the ones that are still being discovered and otherwise rendered accessible, let alone the “unconventional” fossil fuels in the North American tar sands. The battle to stop the Keystone XL pipeline offers us a chance to draw a defensible line in the sand. Which is not to say that it’s going to be easy to win. As destructive as unconventional fossils are, the game is set up to make them profitable, and this is unlikely to change in the near future. In fact, it’s unlikely to change at all, except in the context of a much broader, more than merely “environmental” shift against self-dealing elites and in favor of the real interests of ordinary people. In the meanwhile, we have to fight this fight, and we have to fight to win, because developing the unconventional fossil resource means investing in continued fossil lock-in. Further development of the tar sands (which is what Keystone XL is all about) represents a recklessly stupid energy policy that speaks extremely ill of its advocates. It more or less explicitly amounts to a choice of blindness, and a refusal of legitimate hope. It must not be allowed to happen. If we really want to stabilize the climate system, then we can’t even burn the majority of the conventional carbon that the fossil companies are already carrying on their books. Not even close. Which goes a long way towards explaining why the term “climate emergency” isn’t a hyperbolic one. An emergency is something you may choose to ignore, but only at your peril. This one, in particular, has all sorts of cascading implications. The technology wars (e.g., over nuclear power and carbon sequestration) are part of the story, as is the fact that peak oil isn’t going to save us. We’re going to have to save ourselves, and barring a miracle on the sequestration front (which is nowhere on the horizon) we’re going to have to do so while leaving the oil in the soil. The math simply allows no other result.